I take the train to and from class every other day, the train ride is an hour and a half both ways, in order to keep myself entertained while on the train I've been loading up a bunch of anime on my Vita. This week was special, I've got new shows to watch! The new season has started and I wanted to give my impressions so far. I tend to watch a whole bunch of shows at the start of the season and then continually whittle them down until just a few remain by the end. Now, I haven't watched all the ones I'm going to be watching this season, but here's a good start. Oh and Richard Eisenbeis wrote up a complete guide for the season here. To start out our mini reviews, I loved this episode. I thought pretty immediately upon hearing of this show that it would emulate SAO, thankfully that's not the case, it distances itself and establishes a unique feel right away. That being said, it is a show about real people being stuck in a MMO and finding out what was going on. It focuses on a lot of the details of the world, nicely fleshing out the setting. It also adds some real humor in which I loved. Oh and the fact that the main character isn't a sword wielding badass, but rather the strategist mage is a cool move by the show. I give it 5/5 trains. Eijun is the pitcher at his local middle school and the captain of his team, too bad they never won a game! But when a prestigious Tokyo Baseball School comes to his town to recruit Eijun the baseball journey of a lifetime starts! It's your pretty standard sports anime, but Eijun is a really charasmatic lead character. I like it so far, I give it 3/5 trains. People new to the series beware, it doesn't have a real gap between the end of the first season and the start of the second. It doesn't spend much time recapping last season. I found this great, if only because I had recently rewatched the first season and it felt like just another episode from last season. That said, it had some great backstory for Kagami and introduced another member of the Generation of Miracles. Good stuff, I'll give it 4/5 trains. It was entertaining. It was humorous enough for me to watch another episode. I get the feeling that each of the characters introduced in the first episode have a lot more to them then let on here. Favorite character so far? Mitsuo. Dude's a laugh riot. It wasn't a blockbuster smash hit for me, but I like it enough to keep watching for now. I'll give it 4/5 trains. By far and away my favorite new anime of the season. It has BEAUTIFUL animation (KyoAni strikes again). It's an action story that's interspersed with some slice of life. It's got an interesting setting. It's got a new take on the main characters, and Blood bending which is always neat. 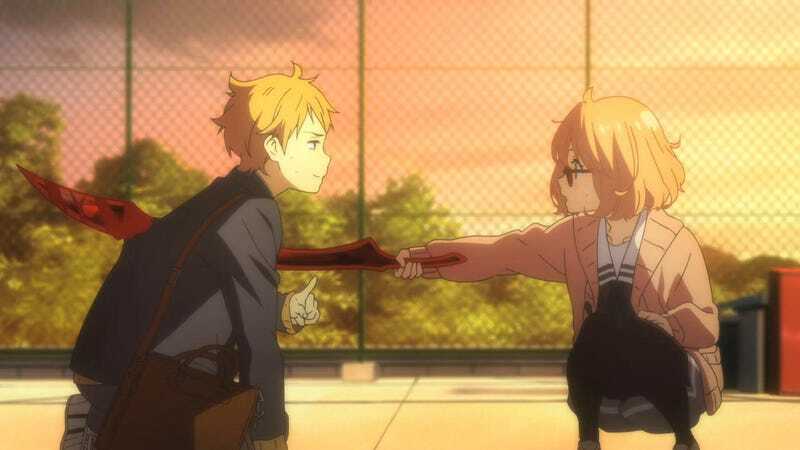 Plus Mirai Kuriyama is adorable :3 I give this one 5/5 trains. Meh. Overwhelmingly this is the feeling that I came away with when watching the show. It has a cool setting with half of it dealing with seapeople living in a city under water and the other half on land, but the story felt meh (racism allegory, friendship/relationship between two who can never be together) it was just kinda really not up my alley. I'll be dropping this one, now. I give it 2/5 trains. This one's pretty interesting, at least it has an interesting premise. The world now knows about monsters and supernatural things, they're quarantined on their own little island off of Japan now though. Things are fairly stable until the "fourth progenitor" (whatever that means) shows up. Apparently it's a super powerful vampire. Oh and he doesn't want to be a vampire, he wants to be normal. Aaaand he's our protagonist. Could be interesting, could be totally cliche'd by the end, we'll see. I give this one 3/5 trains. Very straight forward and fairly entertaining the humor level is top notch, the action really pretty and generally a very well made anime, although the plot device revolving around the fan service is kind of contrived. I'll probably be watching this one throughout the season if only because it's so darn pretty. I'll give this episode 4/5 trains.